There are several types and options of the platform hitch devices that you can add to your Rialta. But make sure you get one that fits into your receiver, either 2" or 1-1/4". Cost for such devices are about $75 to $150 depending upon several factors. The aluminum built ones are probably better suited for the Rialta because the carrier platform itself adds less weight than similar steel built ones. Even though the steel ones may have a large weight capacity, you are still limited to the Rialta's rear axle load limitation. Everything you load onto the platform will add increased weight to the rear axle load which is probably already near its limit. Unless your platform can swing or slide out of the way, you may have difficulty in opening the rear compartment door. Even if the axle and hitch can handle the weight, it will likely change the handling characteristics of the rig some. HitchHaul is one brand of several makers of hitch carriers that merely fit into the existing receiver bolted to the rear of the Rialta. Before buying any such item, verify the size of your receiver on the Rialta; beginning sometime in the 2003 model year, Winnebago switched from the standard 2" size to the smaller 1-1/4" size. Hauler construction is typically either steel, aluminum, or polypropylene. 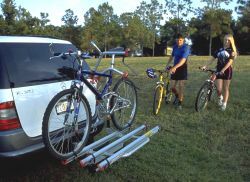 Some may offer side rails and tail light kits, cargo nets, or complete cargo bags. There are multiple sources for such products and they include any RV dealership, Camping World, Wal-Mart, and other major RV product stores. Some specialty online sources include EuroCampers.com, Draw-Tite, HitchHaul, Cajun Outdoor Cooking, and others.